When Ted and Bob decide to start a small business together, they get more than a loan from the bank - they get involved in a bank robbery. To pay the rent after his girlfriend runs off with another man, Craig moves back home. Wombat Crescent is thrown into uproar when Ted drops paint all over his treasured chair and then wins a free funeral. When Ted takes over coaching a local basketball team, he amazes everyone by reaching the finals. However, he must revert to trickery when his star player breaks a leg. Desperate for money, Ted agrees he'll do anything for Bob if he'll lend him five hundred dollars. Bob agrees however, he wants Ted to do some commercials for his car dealership - selling Datsuns. When Ted is retrenched, his arch enemy, Sister Maria, buries the hatchet and assists Ted to find a new career. 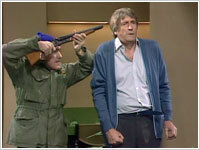 Ted and Cousin Reg turn to crime when they try to convince Bruno to buy a burglar alarm. The gala charity opening of Merle's play is threatened when the star has an accident and Ted is forced to stand in. When Ted tries to demonstrate his old amazing escaping act, He finds his skills are a bit rusty. The family is shocked when it seems that Rosa is not only having an affair with the postman but with Ted as well. Confusion hits the Bullpitt household when it seems that the Prime Minister's wife wants Merle to design her clothes.